Renewable Developments Wales is developing a 25MW biomass to energy facility in partnership with Manhattan Loft Corporation at Trecwn. The project is hoped to be the catalyst for economic growth and job creation within the Trecwn Valley and North Pembrokeshire. 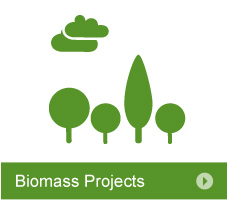 If you would like further information or are interested in a biomass power generation project on you land, please contact us for more details. Biomass is biological material derived from living, or recently living, organisms. In the context of biomass for energy this is often used to mean plant-based material, but can equally apply to both animal and plant derived material. Fossil fuels such as coal, oil and gas are also derived from biological material, but material that absorbed CO2 from the atmosphere many millions of years ago. As fuels they offer high energy density, but making use of that energy involves releasing carbon that was sequestered or ‘fixed’ in the fuels millions of years ago. Combustion products of fossil fuels, unless captured or stored, are usually released to the atmosphere, returning carbon sequestered millions of years ago and thus contributing to increased atmospheric concentrations of CO2.